WARSAW, Poland (AP) — European Council President Donald Tusk was met at Warsaw’s main train station Wednesday by hundreds of people — both supporters and angry opponents — as he arrived to testify in an investigation. The mood at the train station was tense, with supporters of the former Polish prime minister carrying EU and national flags and chanting “Donald, we are with you!” while opponents hurled accusations of crimes and of hurting Poland’s interests. One detractor held up a large mock-up photo depicting him in striped prison garb. Tusk is only a witness in the current case — an investigation by military prosecutors into alleged secret illegal contacts between Polish and Russian intelligence officials at a time when he was still prime minister. “I have no doubt this is a part of political witch hunt,” Tusk told reporters while walking to the prosecutors’ office surrounded by bodyguards. He wore a daffodil on his jacket, in honor of the anniversary of the Warsaw Ghetto uprising against Nazi occupiers. However, many see his questioning as part of a larger attempt by Poland’s nationalist government to discredit a political foe by linking him to scandals and perhaps imprison him eventually. With still strong backing in Poland, Tusk could prove to be a serious rival to the ruling party in the 2019 parliamentary elections and in the 2020 presidential election. Tusk has also been accused by the Defense Minister Antoni Macierewicz of treason in another matter, the handling of the aftermath of the 2010 plane crash in Smolensk, Russia, that killed Polish President Lech Kaczynski. Prosecutors have not revealed details of the alleged illegal contacts, but they are investigating whether the heads of the intelligence had neglected their obligation to seek Tusk’s approval for cooperating with foreign intelligence. Polish media reports say the deal was aimed at allowing Polish investigators working on the Smolensk crash to operate on Russian soil. “I have no reservations as to the work of the (special) services,” Tusk said. Poland’s current ruling party, Law and Justice, is led by the late president’s twin brother, Jaroslaw Kaczynski, a nationalist politician who is a long-term political rival of Tusk’s. Kaczynski drove the failed effort last month to block Tusk from getting a second term as head of the European Council. Only Poland opposed Tusk’s re-election, with 27 other EU members supporting another term for him. In their chants, Tusk’s supporters said he beat Kaczynski 27-1. Kaczynski and others accuse Tusk of failing to oversee proper security for the presidential flight. They also fault Tusk for letting the Russians carry out the main investigation and for failing to get the wreckage back. Supporters of the government also blame Tusk for pro-business policies during his 2007-2014 term that they feel hurt the country. Those policies helped drive strong economic growth, but many Poles felt left out by the economic boom. “Tusk should face justice for having brought Poland to ruins, for closing shipyards, scandals, for Smolensk, for working together with Russia. We still can’t bring the wreckage back,” said Halina Wojcicka, 74, a retired office clerk. 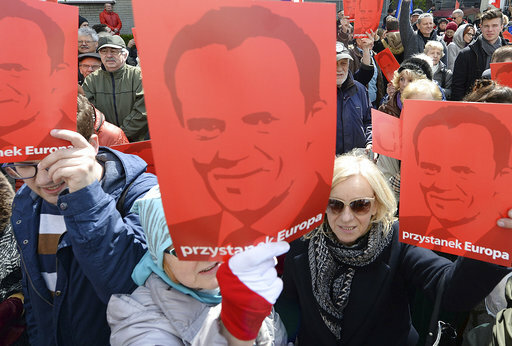 Those who rallied to support Tusk expressed opposition to Poland’s larger political direction under Kaczynski, which opponents view as xenophobic and having authoritarian tendencies.